Composed more than 200 albums despite living a short life. Had an unbelievable vocal frequency that actually flustered the studio recording artists as they had to re-tune their machines to captures his exceptional vocal range. Raised the genre of Qawwali from India and Pakistan to lands as far as Hollywood, Japan and Russia. For the first time, Sufi Music joined the world stage as a proper music genre. Nusrat Sahib raised singing of Kalam of Bulleh Shah to an unprecedented level, whether it is Baba Bulleh Shah’s famous Mera Piya Ghar Aya or the amazing Gal Ek Nukte Wich Mukdi Hai. Nusrat Fateh Ali Khan had great respect for Hazrat Imam Hussain R.A. and Hazrat Ali R.A. , which is evident from his evergreen Qawwali such as Ali Maula Ali Maula Ali Dam Dam, Ali Da Malang etc. Below two remain alltime favourites. Hamd Bariya Taala or Praise of Allah Almighty is a genre of poetry in which Urdu and Punjabi excelled. 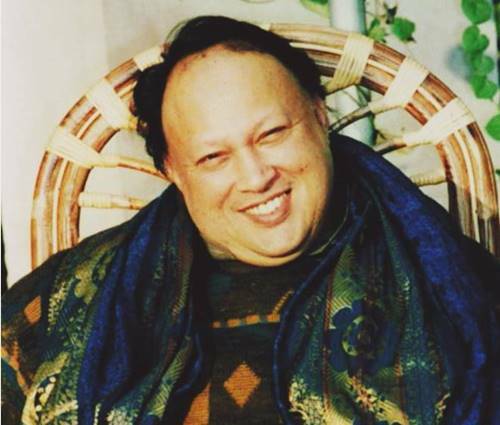 Nusrat Fateh performed few Hamd Kalam but showed his exceptional versatility in then too. There is so much to write but I conclude saying that Nusrat Fateh Ali Khan’s untimely death left a vacuum that is hard to fill. There are many qawwal who imitate him however, the genius compositions of Nusrat Sahib is something we still miss as all these artists keep remixing the same tunes again and again that NFAK once composed. Next story Dr. Javed Iqbal [son of Allama Iqbal] at Mazar of Allama Iqbal.